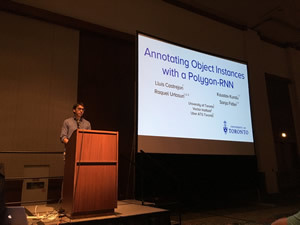 Presentation of Annotating Object Instances with a Polygon-RNN; right, master's student Lluís Castrejón, Assistant Professor Sanja Fidler, PhD student Kaustav Kundu, and Associate Professor Raquel Urtasun at CVPR. 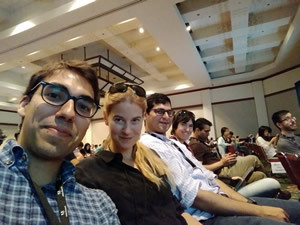 CVPR is the premier annual computer vision event, held this year the Hawaii Convention Center July 21-26, in Honolulu, Hawaii. CVPR received a record 2680 valid submissions and a total of 783 papers were accepted. Of these papers, 71 of these were allocated long oral presentations and 144 were allocated short spotlight presentations. All papers also appear in the interactive session where posters are presented. There were 5,000 attendees at this year's conference.